Today marks the end of Dark Cybertron, the first real big event in Transformers comics, spanning many months and 12 issues, including both Robots in Disguise and More Than Meets The Eye. One of my esteemed colleagues on this website has already chimed in with his thoughts on this crossover event and he did not have a lot of good to say about it. I endeavor here to give my own thoughts and perhaps offer a slightly different viewpoint. Now that I have the entire storyline laid out before me, I can try to pick out what they wanted to accomplish with it and the first thing that pops into my mind is the phrase “Chekhov’s Gun”. Many months and issues ago, James Roberts walked onto the scene with a gun that he placed on the table and not until issue 12 of Dark Cybertron did it finally go off. 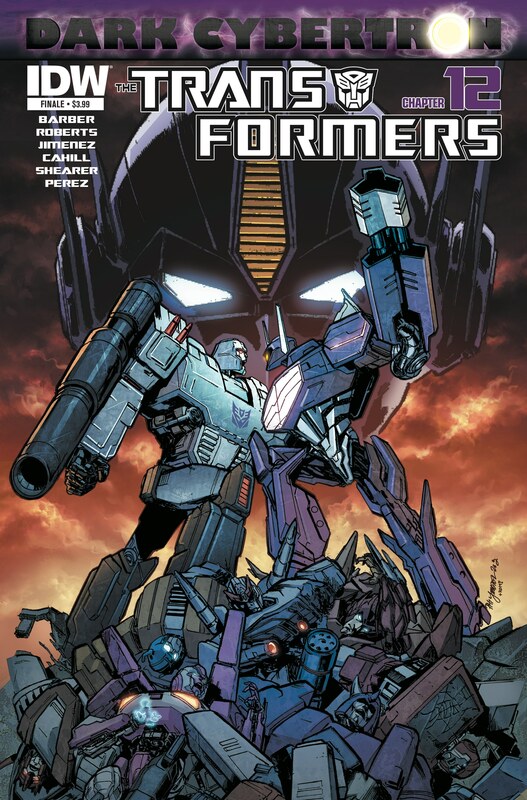 I speak of the storyline in MTMTE called “Shadowplay”, where it is revealed that Shockwave was once one of the good guys and a friend of Orion Pax, but was twisted into the purple one-eyed logic-obsessed creature we are all familiar with. It might be a bit clichéd, but what saves everyone’s bacon in the end is how the unraveling of space and time, plus some coaxing by Optimus, helps Shockwave remember who he was and come to the realization that the only way to save the universe is that Optimus Prime kills him, putting the poor guy out of his misery in the process. Thus we can finally close the book on all of Shockwave’s plans and plotting and start afresh. There is also the fact that Orion Pax finally reclaims the title of Optimus Prime after going through a little “midlife-crisis” as Megatron puts it, thanks to the encouragement of Rodimus, who has come a long way from who he was when the Lost Light first set off. We have been properly introduced to the existence of more robots that identify as female, which seems to have been some comfort to Arcee. After all, is it not worse to think you are the only one who’s different from all your peers? To have a group to belong to can make everything feel just a little bit better and make you feel more comfortable in your own skin. And there are other minor bits that were brought about through the crossover story line. Some characters were brought back from the dead, if only so they might die in an apparently more glorious fashion. Jhiaxus dies at the hands of Starscream, after a brief stint in his new toy body. Some were saved from the Dark Universe, which seems to have played out its part in full now. I am unable to fully comment in full on Starscream’s story arc, as I did not keep up with RiD before this event, but it does seem like his scheming has been brought to a halt and it might be time for the Seeker to step back and reevaluate his life up until this point. Ruling Cybertron really wasn’t as easy as he thought it would be. I look forward to what he’ll be doing in issue #1 of Windblade. Before I only reviewed More Than Meets The Eye, but when the Dark Cybertron event kicked off, I felt it unfair to judge those issues individually and I stand by that decision now. It’s true that there were weaker issues and stronger issues, but taken as a whole I do not regret keeping up with it. I was brought back to Cybertron and got to meet characters I had not seen for a while, in a way I was like one of the crew members of the Lost Light, back for a homecoming. Writer James Roberts refers to the upcoming issues of More Than Meets The Eye as “Season 2” and that’s what made it click for me. Dark Cybertron is the summer blockbuster movie that bridges the gap between two story lines and seasons, where characters can mingle and come back slightly different. Not all summer blockbusters are great works of art, but they are always entertaining. If anything I should applaud the effort of IDW, that they even attempted such a thing, with two writers collaborating (as has been told in an interview on this site) and juggling so many different artists. So, thank you, to everyone involved. 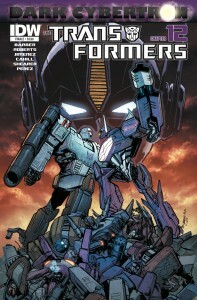 I look forward to what the future will bring for IDW’s Transformers books. Wow.Thumbs up for an awesome review.Really good quality.Keep up the good work.